The owners of this lovely website, Beth & Gemma, have had the wonderful idea to offer kit to make your own cushion cover. 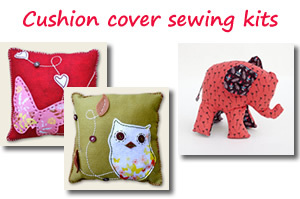 Ideal to introduce your kids to sewing (under the supervision of an adult! ), you can choose between 3 different cushion cover designs: butterfly, owl and rabbit. Each kit has everything you need including pre-cut felt shapes, stuffing and a plastic needle. The cushion cover size is 25cm x25cm but you will need to buy a cushion pad separately. If you are looking for some more advanced designs, Gemima Craft Kits are selling lovely sewing kits boxed in beautiful recycled boxes. Each box contains all the materials for each project, along with clear instructions and templates. Their materials are sourced in the UK as far as possible using quality handicraft felts, vintage fabrics and also Liberty Prints. Their products can be found on notonthehighstreet.com. Inspired by toys of childhood, their range contains products that would appeal to children and adults alike. Guess which kit is the most popular? The Elephants! For patchworkers there is a cushion cover kit or hexagon patchwork pincushion kit – both using Liberty Prints. Kits make lovely gifts or even projects to make and give!